Who is best at guessing the heritability of traits? 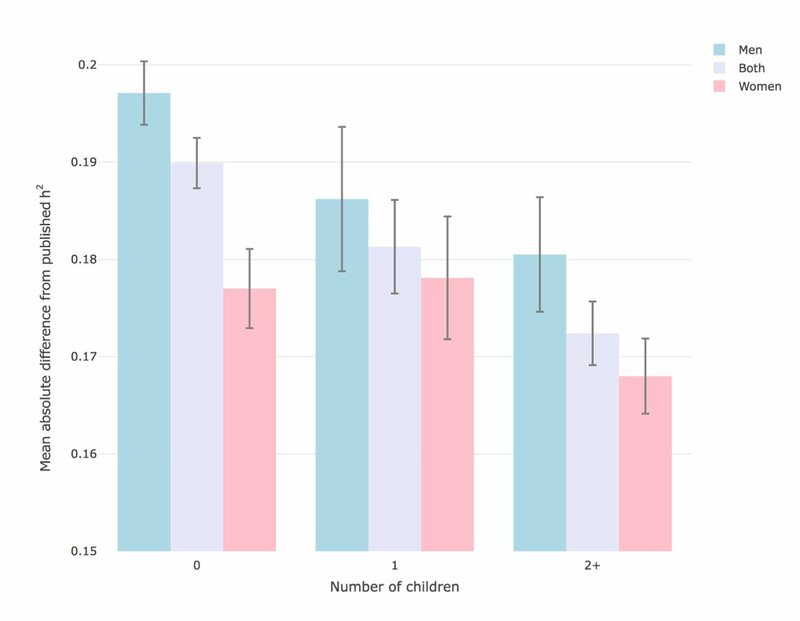 Comparison of absolute mean difference scores in accuracy of heritability judgments across surveyed human traits for men, women, and full sample for those without children, one child, and two or more children. 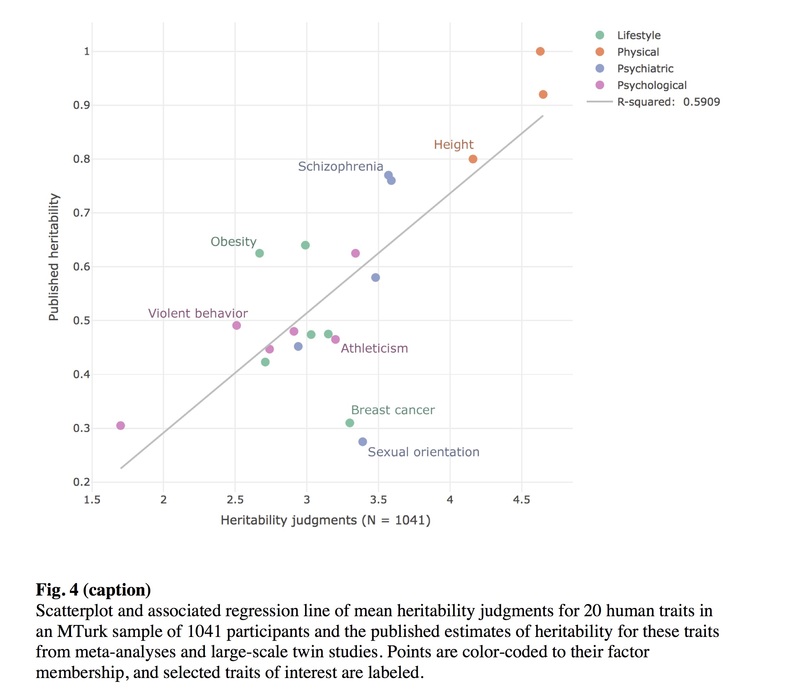 These estimates represent the magnitude of distance between each participant’s judgment of heritability and the published estimate on a 0 (only environmental factors) to 1 (only genetic factors) scale. Lower mean distance (y-axis) therefore represents better judgment of heritability across all traits. Error bars represent +/- standard error of the mean. And how did the people predict the different traits? The fact that genes and environment contribute differentially to variation in human behaviors, traits and attitudes is central to the field of behavior genetics. To the public, perceptions about these differential contributions may affect ideas about human agency. We surveyed two independent samples (N = 301 and N = 740) to assess beliefs about free will, determinism, political orientation, and the relative contribution of genes and environment to 21 human traits. 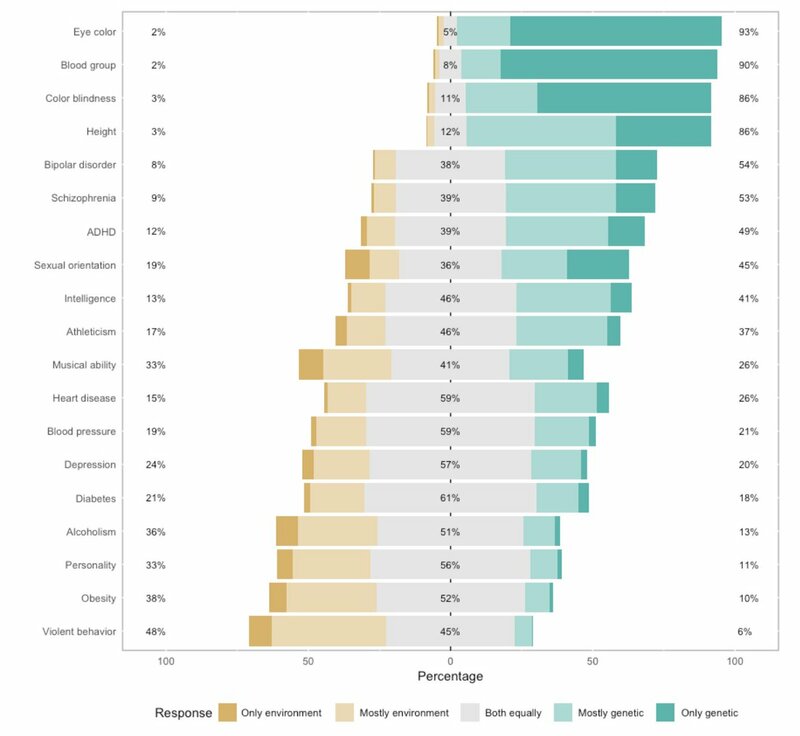 We find that beliefs about the heritability of these traits cluster into four distinct groups, which differentially predict both beliefs about human agency and political orientation. Despite apparent ideological influences on these beliefs, the correspondence between lay judgments of heritabilities and published estimates is large (r = .77). Belief in genetic determinism emerges as a modest predictor of accuracy in these judgments. Additionally, educated mothers with multiple children emerge as particularly accurate in their judgments of the heritabilities of these traits.